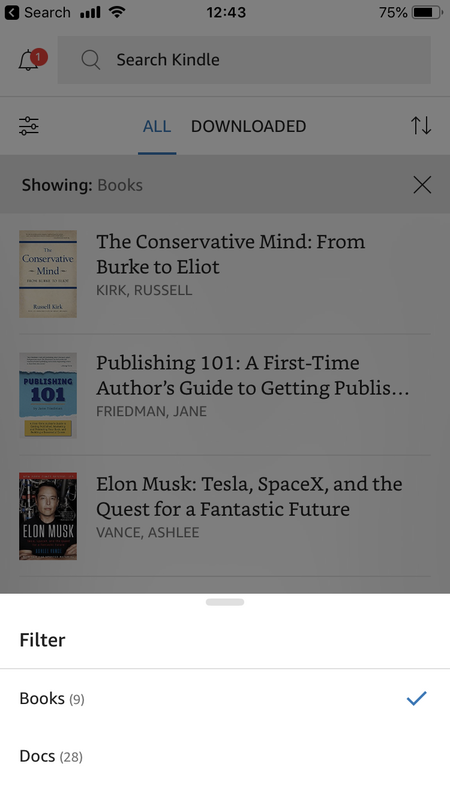 Amazon's Kindle app treats files you add to it, that you did not buy on Amazon's bookstore, like second-class citizens. Rather than treating files like Leanpub books as "Books," Kindle classifies Leanpub books as "Documents," and they purposefully make these "Documents" a bit difficult to find. Of course, because Amazon owns Kindle, it can change the design of its apps and how things work on its devices at any time. This means that we can provide you with advice, but not up to the minute guidance, about another company's service. Here's an example of how Amazon hides documents. In the Kindle app on Len's iPhone, he had to click the funny icon at the top left, under the bell, to get an option at the bottom of the screen to get to his "Docs:"
If you're having trouble finding your Leanpub books in the Kindle app on a computer, or on a Kindle device, we recommend you contact Amazon customer support. We've had reports that notation syncing does not work for "Documents" on the Kindle app. If you have evidence to the contrary, please email us at hello@leanpub.com and we'll update this article.